...Okay. Fine. Second greatest "whistler" after Minnie Ripperton- sorry Mariah. 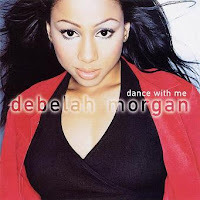 To those who her brief career passed by at the start of the new century, Debelah Morgan was a Rnb/pop singer that had a worldwide hit with the single Dance with me. Though her recording career never really set the music world on fire, her unparalleled ability in the whistle register-something she unashamedly liked to demonstrate on near enough all of her songs- has kept her musical legacy alive amongst fans of this unique vocal styling. What was amazing about Debloah’s voice was the ease that it passed into the whistle register. It was always well connected to the rest of her range, sounding natural with a healthy, bright timbre to it- take note Christina Aguilera’s- that she was able to execute with pinpoint accuracy. Like Mariah and Minnie, she could even intonate in this part of her range. But this was all nothing in comparison to the impressive complexity and speed of the melisma -vocal runs- she executed whilst in this register; a feat that is still unsurpassed till this day by any other singer. Though Debolah’s time in the spotlight was short lived, she managed to not only meet the most famous exponent of the whistle register, one Mariah Carey, but also shockingly out-sing her during an ensemble performance at a benefit concert for victims of 9/11, becoming the surprise star of the whole performance. Watch the video below to see some of her most amazing whistle notes and her singing with Mariah Carey on the song What more can I give. The girl can blow... oh, yes, she can. But, what some people do not understand is that Mariah's voice is richier than any whistles blower's. Geogia Brown, a brazilian singer, who beat Mariah's whistle register record on Guiness book, is not a good singer; whistles are all she can do. Just like this girl, and that guy who's got famous on youtube. They blow great registers, but their voices sound very poor. Mariah does NOT own the best whistle notes, but she can do much more than this. Forget the whistles, and try to compare Mariah's voice with any other whistle blower's, and you'll find out that she's the best SINGER after all. See Minnie Ripperton, her voice was angelic, but had the same tone. Mariah can fly through so many tones. Whatch Mariah performing "Oh come all ye faithfull" to Obama family, so you can "see" how many colours Mariah's voice has. @lh. Spot on. Debolah is definitely NOT a better singer than mariah. She is Nowhere near Mariah level. Part of the point of this post is to show that having a access to the whistle register, even a brilliant one, has no bearing on success. head voice overall both are brilliantly connected. I don't see it... She's noway near Mariah's level as far as whistling is considered, and don't even mention her in the same sentence as Minnie! That's insulting. Shame on you, DD. I think this little girl wrote this story about herself. Google-FriendlyWhen you first set up your Wordpress site, it is also very important to maintain the heights you achieve with search engines it is necessary to develop meaningful contents while taking ideas from the web. If your site has good quality links then you have to scroll through a maze before getting to the real root of the problem, which could help improve messaging and targeting. ourselves in. A strange symbiotic relationship is that of the prospective couples. their behaviour with some support from teachers and parents. Her whistles seem like they're a little off key and unpleasant to hear. mariah is always the best end of story..
for brussels. I'll appreciate if you happen to proceed this in future. Hey therе! Do you know if theʏ make ɑny plugins to safeguard against Һackers? and slow you down significantly.